Zephyrhills 100th Anniversary: Thanksgiving & ZHS families - Zephyrhills, Florida 100th Anniversary! In an age of ever-changing technology and fast paced-living, we want to pause this week to share our gratitude to the community. We thoroughly enjoy the opportunity to impart some historical tidbits from the last one 100 years that have shaped our town. At the annual ZHS alumni celebration, the monthly 100-year committee meetings, or local school events, we consistently witness the importance that the instutution of ‘school’ has had a place of gathering, organization and growth for children and families. Thanksgiving is, of course, also a time of gathering, family focus and appreciation of our country’s heritage. We suspect that many may recall Thanksgiving pageants at school that encompassed Pilgrims, American Indians and symbols of Harvest. The historical accounts from the Zephilsco, News, and other sources depict PTA celebrations, classroom events and service projects in the community. Perhaps the most noteworthy of Thanksgivings was that of 1939 when ZHS was closed for two weeks because of diptheria outbreak. Ironically, in 2009 with H1N1, it is not the first time the local school has been challenged with health questions and persevered to benefit students and families. Thanksgiving takes on many dimensions for us. You may be traveling, hosting your family, working at a center to serve up a scrumptious meal for others or perhaps savoring some past memories. We also know that families come in all configurations and for some institutions such as church and school comprise dimensions of nurturing as well. The theme of family has often been a thread throughout our historical research about Zephyrhills High School. Just recently in our interviews with James E. and Claudette Davis, Raybell Surratt, Charles and Ann Henderson, Bunt and Cookie Massey and others, we have been mesmerized by their many warm stories about people and traditions in our community. The Clements, Rooks, Reutimanns, and others have jogged our memories about sports, entertainment and events that locals cherish. Along the way with the assistance of the Depot, Zephyrhills Historical Society and so many individuals, wonderful photos have surfaced that often capture events without words. So with that in mind and perhaps with the old script of that Thanksgiving Song by Lydia Maria Child that so many of us sang in school at this time of year, “Over The River and Through the Woods To Grandmother’s House We go…” we wish to share three photos that capture three example families from Zephyrhills over time. The dates are: 1945, 1960 and 1969. It so happens that two of these families were in the midst of visiting grandparents when the photos were snapped and all three photos give us a glimpse of the importance of connections in our lives. Happy Thanksgiving! 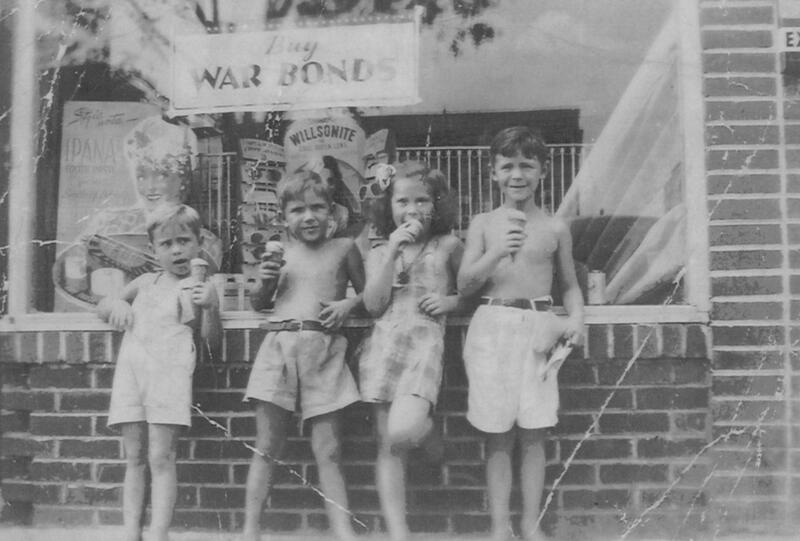 The Miller children stand in front of the landmark Neukom’s Drug Store which posted a sign announcing, ‘War Bond Sales.’ The photo taken in 1945 showed Larry, Glenn, Nancy and Craig Miller enjoying a refreshing ice cream cone in downtown Zephyrhills. Feel the home-town warmth! 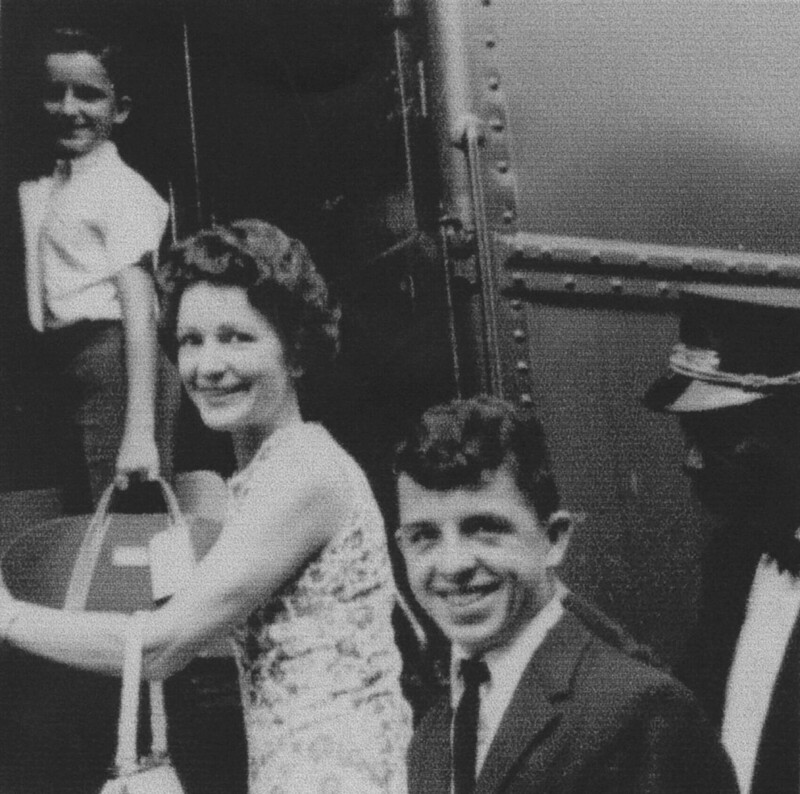 The First family including Mary Crawford First and sons, Gary and Greg traveled to Cleveland, Ohio to visit their grandmother in 1960 by railroad and they boarded the train at the Zephyrhills Depot which was then located where the Village Inn is now located. “At that age, nothing was more fun than riding a train, especially visiting the dining car,” said Greg who has been the ‘voice of the local Zephyrhills High School Bulldogs’ for over twenty years as sports announcer. 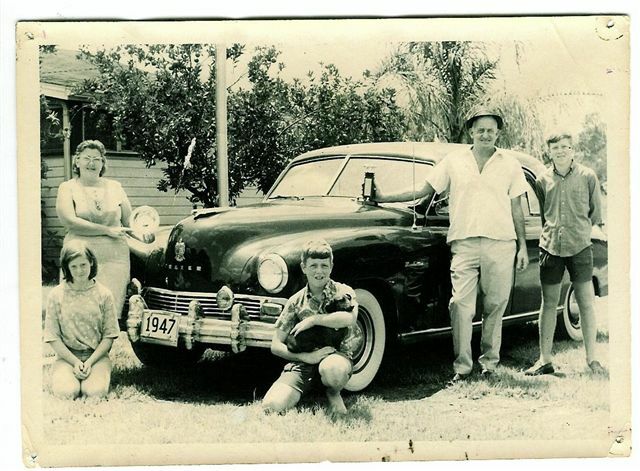 Bernie Wickstrom ran the Travis family photo in the Zephyrhills News after the family had just returned from an antique car show in 1969 and a visit to the grandfather’s home. Mr. Travis had a hobby of restoring Kaiser autos and this was a vintage 1947 Frazer Manhattan made by Kaiser-Frazer. They had just driven from Zephyrhills to visit relatives in upstate New York and they recalled watching the moon landing on their Grandfather’s black-and-white TV, this was the era of Woodstock. In the photo were: June, Cindy, Jeff, Bob and Cliff Travis along with their dachshund, Penny. For Clereen and Madonna, family is an essential part of our lives, and we wish each and everyone a very lovely Thanksgiving! We hope sometime during the holiday weekend, you’ll have an opportunity to remember some family events that have shaped your life. Whether you are visiting grandparents or perhaps savoring our lovely Florida weather with an ice cream cone instead of a turkey, we know you’ll remember past times as we do! In our ongoing effort to capture the memories, please send us your stories about Thanksgiving. By Madonna Jervis Wise and Clereen Morrill Brunty of the 100th Anniversary Committee, ZHS. Article originally appeared in the Zephyrhills News on November 19, 2009.